Researchers Discover The Lean Body Hormone That Dramatically Prolongs Life Of Laboratory Animals, But A Drawback Keeps It From Becoming An Anti-Aging Agent. But There Are Shortcuts. 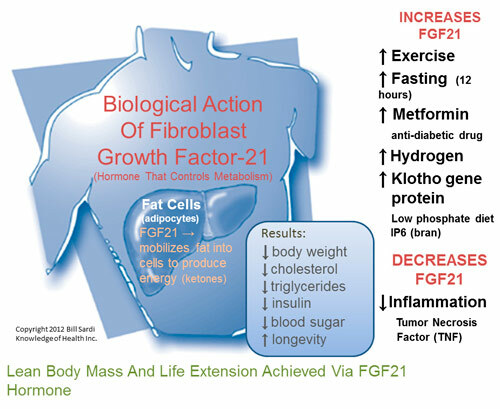 Since its initial discovery in 2000 by researchers in Japan, the hormone known as fibroblast growth factor-21 (FGF21) has intrigued biologists and endocrinologists. Mouse FGF21 is highly identical to human FGF21, making it useful for laboratory comparison. It didn’t take long for investigators to realize FGF21 is a “novel therapeutic agent for human metabolism” in the regulation of sugar utilization, particularly in fat cells (adipocytes) in the liver. Therapeutic provision of FGF21 to laboratory mice reduces blood sugar levels and these animals are resistant to obesity. And FGF21 does not induce hypoglycemia (low blood sugar), cancer or weight gain at any tested dose in diabetic or healthy animals. Biologists were beginning to think of it as an ideal hormone/drug to treat diabetes. The biological activity exhibited by FGF21 was found to be dependent upon a gene called Klotho that makes beta-klotho protein that in turn increases the ability of cell receptors for FGF21 to direct its beneficial effects upon fat cells in particular. Researchers also discovered that FGF21 interplays with a metabolic pathway called PPAR (peroxisome proliferator-activated receptor) that aids in the transport of sugar to fat cells and the burning of fat. Since an energy supply is essential for life to be maintained, researchers were elated to find that FGF21 helps to maintain energy in living cells during starvation or fasting. This makes FGF21 a necessary hormone to facilitate hibernation in animals since they obviously don’t consume food during that time. During periods of fasting, starvation or hibernation, cells must still produce energy or die. When food is withheld from animals for 12 hours or longer, liver cells produce FGF21. Researchers found that FGF21 switches the body to a fat-burning mode and allows the body to fuel itself with stored fat during times of food deprivation. FGF21 mobilizes lipids from fat cells and directs the liver to transform those energy-rich molecules to circulate throughout the body. Just the provision of FGF21 by itself produces the same biological responses as fasting without having to deprive calories. One researcher says FGF21 has “almost magical properties” as it improves insulin efficiency, lowers circulating levels of cholesterol and trigylcerides and averts age-related weight gain. Biologists were not only beginning to think FGF21 is a remedy for diabetes, but it could also prevent obesity after it was found that administration of FGF21 to laboratory mice resulted in a 20% reduction in weight. A human population study finds that elevated blood serum levels of FGF21 are associated with abnormal blood sugar metabolism and insulin resistance seen among patients with metabolic disease (diabesity). However, it should not be misconstrued that increased amounts of FGF21 induce metabolic disease. It just means this defensive hormone is increased as metabolism goes haywire. Interest in FGF21 by drug companies ensued as pharmacologists began to make FGF21 look-alike molecules (analogs) in hopes of producing “superior metabolic” action. FGF21 could become the most advanced weapon against diet-induced diseases ever imagined. Is FGF21 an anti-aging agent? But then investigators gleefully found that FGF21 also inhibits growth hormone. That would also place FGF21 in a class of potential anti-aging molecules. Of interest, vitamin D increases Klotho protein to regulate calcium and phosphate in the body and thus also serves as an anti-aging agent. FGF21 requires klotho protein to function. Two known anti-aging agents were found to work in tandem. These discoveries were very tantalizing for researchers. They didn’t want to jump to conclusions. They needed a lifespan study. Laboratory mice live about 12-18 months. So researchers at University of Texas Southwestern Medical Center in Dallas launched a study to determine if in fact FGF21 will prolong the life of laboratory mice. Their efforts exceeded expectation. But their investigation also wiped the biological drawing board clean and forced biologists to re-think everything they have learned in the past decade. Remarkably, genetically altering laboratory mice so they produce about 5-10 times more FGF2 during fasting resulted in a striking increase in lifespan without reducing food intake. These super-mice lived about 36% longer than normal mice and astoundingly better than 30% of the female mice in the study were still alive at 44 months of age when the study was finalized. The risk of death was reduced by 65% in male animals, 88% in females. These animals apparently burned away their fat much more efficiently. The revved-up FGF21 mice were leaner than normal mice even though they ate about the same amount of food. But all this was accomplished without activating other well-known longevity pathways (sirtuin genes, AMP kinase, mTOR and NAD+). Unexpectedly, calorie restriction, known to double the lifespan of laboratory animals by cutting caloric intake in half, did not trigger FGF21 hormone production. These genetically altered mice are smaller than normal mice as they produce less growth factor (insulin-like growth factor 1 or IGF1). While life-prolonging long-term calorie restriction significantly alters 831 genes in laboratory mice, FGF21-producing mice achieved super-longevity by altering only a small number of genes (33). Wow, it first appeared humanity was on the cusp of a giant breakthrough that could promote health and prolong life beyond any prior imagined mechanism. But there was one drawback. These FGF21 super-mice developed weak bones. Bone loss in these animals “may limit its utility as a therapeutic agent” the researchers disappointingly disclose. So what is the take-home message of this discovery? What can modern longevity-seeking humans do to activate FGF21? 1. One life-prolonging practice might be to periodically fast. A 12-hour fast activates FGF21 which then begins to increase fat burning. There are some people who never eat breakfast, to prolong their daily fasting period. While most dieticians say skipping breakfast leads to overeating and obesity, almost all of the studies on this topic have been performed among growing children. Children are growing, not aging, and certainly don’t fit into the category of middle-agers who are experiencing mid-body weight gain. A study of over 5800 men reveals that breakfast skipping modestly contributes to weight gain. A small study shows two-day a week fasting among adult males reduces weight. 2. 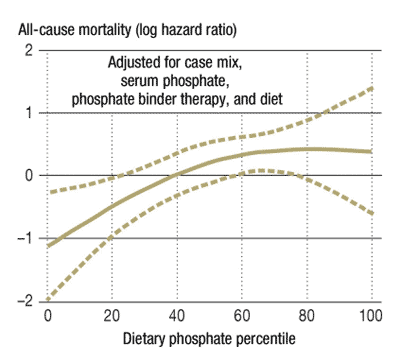 Another approach might be to limit phosphorus in the diet. That is because the aforementioned klotho protein limits excessive over-calcification and phosphorus in the human body. To understand the relevance of phosphorus limitation to aging an understanding of the klotho gene is required. There is evidence that adults who have lower levels of klotho protein in their blood circulation have an increased risk of death. Since FGF21 requires klotho protein to work, investigation into mechanisms of klotho formation may be advantageous. Mice that are bred to produce more klotho protein live about 17.4% longer, not quite as striking as FGF21 itself, but still would add more than a decade to humans if animal research has application in humans. In explaining how klotho works, researchers reveal that dietary phosphate restriction reverses aging in laboratory mice bred to not produce klotho protein. 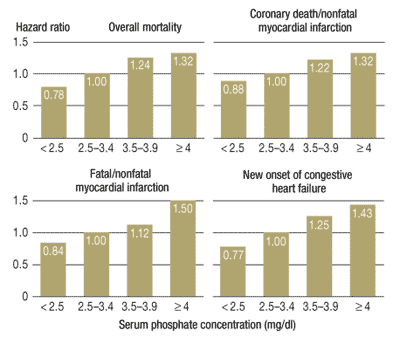 There is genetic and dietary evidence that phosphate toxicity accelerates aging. When mice are bred so as not to produce klotho protein and fed a high phosphate diet, signs of premature aging appear. Researchers in Japan are concerned about increasing amounts of dietary phosphorus which may accelerate aging. Restriction of phosphorus and calcium is advised. House flies (Drosophila melanogaster), used in longevity experiments, age prematurely when provided with a high phosphorus diet. Examine the bar charts provided below. They provide convincing evidence that diets high in phosphorus have deleterious effects upon human health. Many fast foods have phosphate additives. Excessive phosphorus should be considered a health risk. Researchers suggest no more than 1000 milligrams of phosphorus per day. One of the confusing aspects of understanding phosphorus in the diet is that plant foods provide a natural calcium and phosphorus balancing agent called phytate (inositol hexaphosphate or IP6) provided in plant foods which inhibits the digestion of these minerals significantly (from ~80% to ~20%0. It is the inorganic phosphorus in food additives, prevalent in fast foods, that is the culprit here. Supplemental IP6 is available as an extract from rice bran and should be considered a powerful anti-aging substance via its ability to calcifications and phosphorus overload. Researchers in Japan report on a novel way to increase FGF21 hormone via the consumption of hydrogen-fortified drinking water. Mice given hydrogen water lost excessive weight experienced a decline in blood sugar, insulin and triglycerides, all which was correlated with an increase in FGF21. For the really serious pursuers of longevity, on the commercial side there is even a hydrogen drinking water produced in Malaysia that is touted for its health benefits. Other ways to increase FGF21 would be to take the anti-diabetic drug metformin which stimulates FGF21 in human liver cells (requires a doctor’s prescription). Physical exercise has also been shown to increase FGF21 in young women. Copyright 2012 Bill Sardi, Knowledge of Health, Inc. Not for posting on other websites.